This time I remember to bring my camera to capture the sunrise and am greeted with this beautiful vantage. 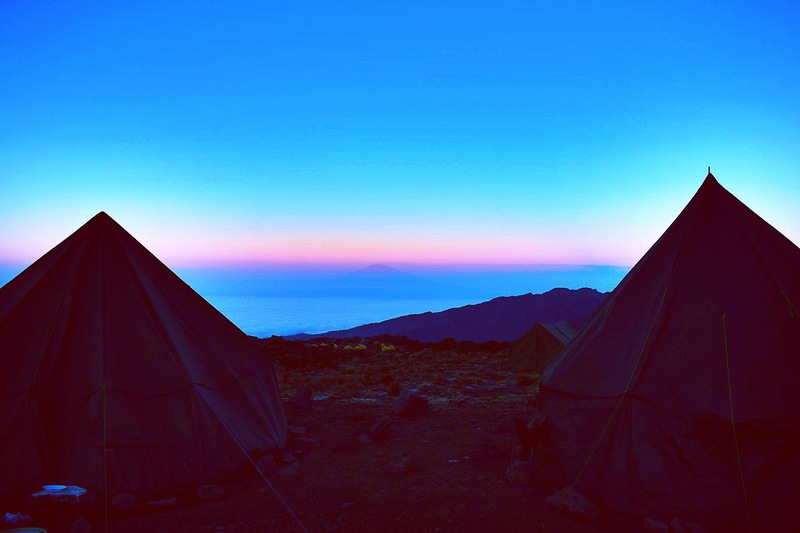 Two tents had been set up to perfectly frame Mt. Meru in the distance. The only way is UP! Well actually today is the day we climb high and sleep low to help us acclimatize. 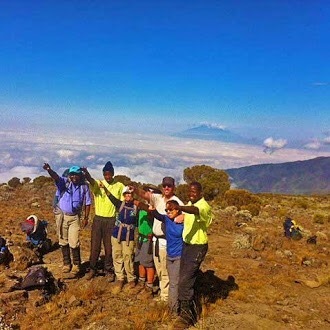 We will go 6.5 miles (10.5 km) and hike up to the Lava tower at 15,230 ft gaining about 2,820 ft (860 m) before descending to Barranco camp at 13,054 ft (3,989 m). Here I am with Ernest (the head guide), Raymond (Rosemary’s daypack porter), Mary (my sister), Gregg (her husband), Cory (ex) and the gentlemanly Stanley (Mary’s daypack porter). Even now whenever I think of Stanley, I recall that every morning we were greeted by Stanley in falsetto wishing us a good morning and offering coffee. And in the distance, there is Mt. Meru and starting to feel like it is the roof of Africa with all the clouds below. Not that I didn’t feel extremely spoiled the entire trip, but lunch at the Lava Tower really hit it home. We were already stuffed from the rest of our lunch but Ernest insisted that we should wait as the rest of the food was being prepared. To quell our protests, he let us in on the story of how the porter who was carrying the oil for the fried chicken had forgotten that it was needed for today’s lunch and had proceeded to go to camp. So another porter had to rush to camp and come back to the tower with the oil! And so of course, we wait and oh boy was the wait worth it – the fried chicken was DELICIOUS! I have no idea how Gaspar (our cook) did it as we had some really delectable food the entire trip. One night I decide to practice my Swahili in the cooking tent and became even more awed. The assistance cook did all the prep work (including chopping up vegetables and meat) on a cutting board that was laid on his lap. And I will always continue to wonder exactly how does one manage to fry such delectable chicken at 15k feet? It really was an amazing trip and so much of that had to do with the company – I am so glad that Mary and Gregg were with us and that we could experience the joy, laughter, and amazement with them. In this picture with Mt. Meru in the distance, Robert, our assistant guide in red, is talking to Gaspar, our amazing cook – notice the eggs on his pack? Back home now, we are missing those delicious breakfasts that he would make with those eggs. Actually, I am missing his cooking in general ad his spaghetti carbonara and fried chicken in particular…. 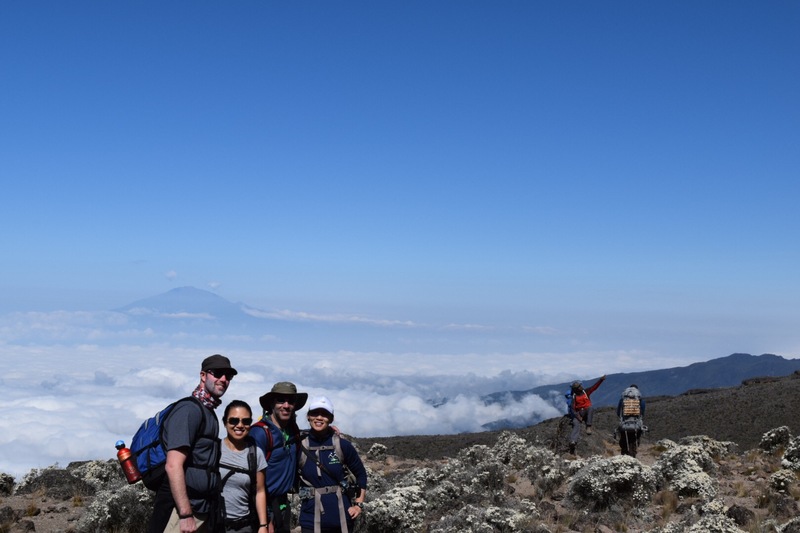 The day’s hike ends when we reach Barranco Camp at 13,054ft (3978m). 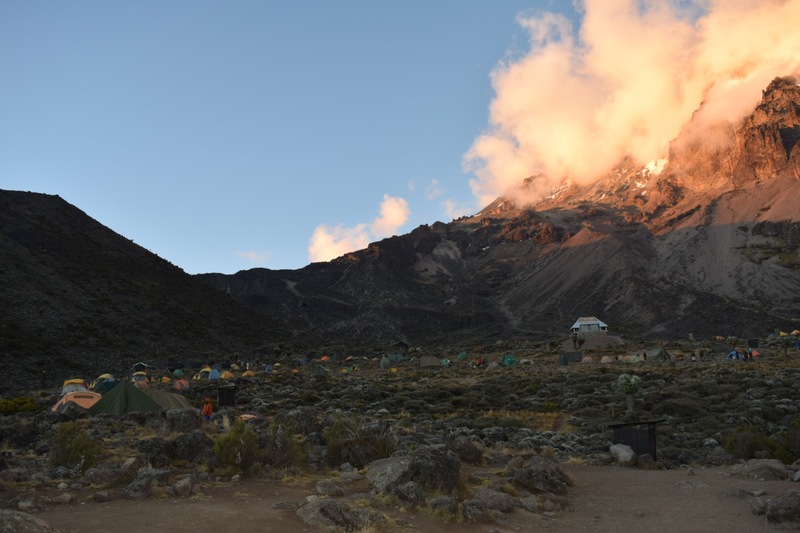 This is a beautiful camp with the dramatic Barranco Wall looming large to the north.